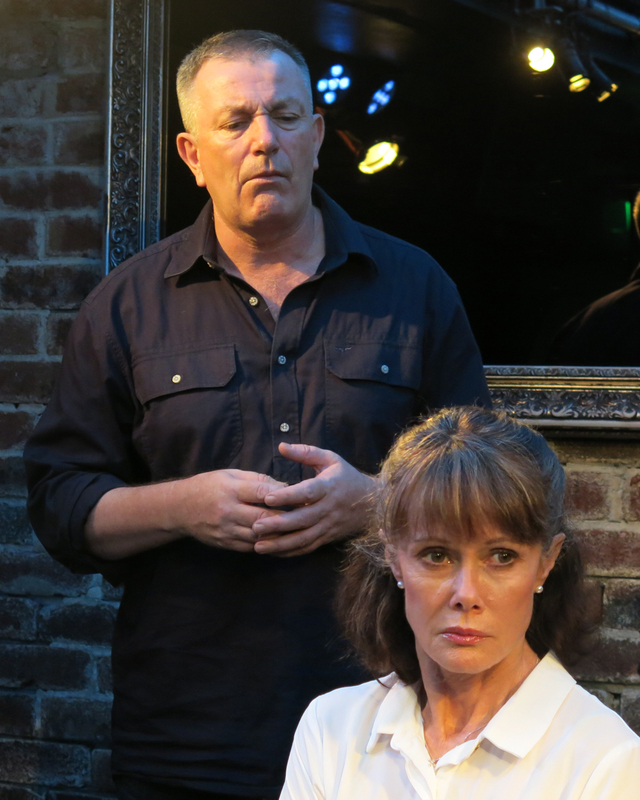 subtlenuance presents ONE WAY MIRROR, by Paul Gilchrist at the Blood Moon Theatre, The World Bar, Kings Cross. 14 - 24 March. ONE WAY MIRROR, is a new Australian play, by Paul Gilchrist, produced by Daniela Giorgi, partners in subtlenuance, a Sydney based, independent theatre company dedicated solely to the creation of new work. Ushered into the Blood Moon Theatre space, which is really a momentarily occupied bar space belonging to the The World Bar, we are met by the company of actors in everyday clothes, and invited to sit around the walls to observe a 'discussion'. It begins with the introduction to a 'potted' history of the World War II war criminal, Adolf Eichmann, up to his trial (and later hanging) for his complicit organising of the Holocaust in Eastern Europe. Eichmann's defence at his trial was that he was simply 'obeying orders'. We, then, are introduced to Stanley Milgram, a famed American social psychologist, who devised an experiment to explore man's willingness to perform acts conflicting with their own personal conscience. The results were published in 1963 as BEHAVIORIAL STUDY OF OBEDIENCE and were a cause of controversy, but not only for the scientific results, but, also, because of the debate that ensued about the ethics of the basic experimental design: a mixture of innocent subjects were used with prepared 'confederates' - actors, at $4 an hour - to establish the results for the research. The use of actors as stooges or confederates in psychological experiments has a long history. Tonight's show is not an attempt to detail that history, but rather an opportunity to share something ..... maybe some questions. Do we behave differently when we are watched? Is the sense of being observed a fundamental aspect of the human condition? We're tempted to see Performer and Audience as some sort of opposites, but are they? To what extent is each of us both? What is the relationship between Science and Art? We're tempted to see Science and Art as some sort of opposites, but are they? Isn't each of these great human endeavours concerned, in their own way, with both Truth and Beauty? Mr Gilchrist goes on to say that he hasn't, over the ten years of his work for subtlenuance, necessarily provided answers but has been grateful for been part of a discussion. This work is an 'intellectual' discussion then - not a narrative play - on experiment ethics and the role of science and art, and the actors: Matthew Abotomey, Alison Benstead, Angus Evans, Sylvia Keays, Sonya Kerr, Mark Langham, Linda Nicholls-Gridley, Ash Sakha and Sheree Zellner, participate with a convinced competency. That the work does not quite lift off the page onto this stage has to do with, perhaps, the fact that Mr Gilchrist is also the Director, and is a trifle too close to the work to be able to see or hear whether what he has guided his actors to do is translatable for an audience to comprehend his writer's discussion. There are signs of conviction going on assuredly, from the actors, but less assuredly is the clarity of the intent and how the content is the development of an argument for the thesis of the writer to inspire insight in/for his audience. In Sydney, we rarely have such ambitious intents from our writers. Intellectual discussion on ethics and other moral modern dilemmas are rarely embarked upon in the theatre experience, here. Mr Gilchrist has an interesting purview and one would like to take away from his efforts more than curiosity and, certainly, less befuddlement. At the moment I feel ONE WAY MIRROR is, literally, a one way mirror. I could not see anything, while in the theatre, but my reflected bewilderment. I could not grasp, in the moment, what was happening and how or why it should concern me.